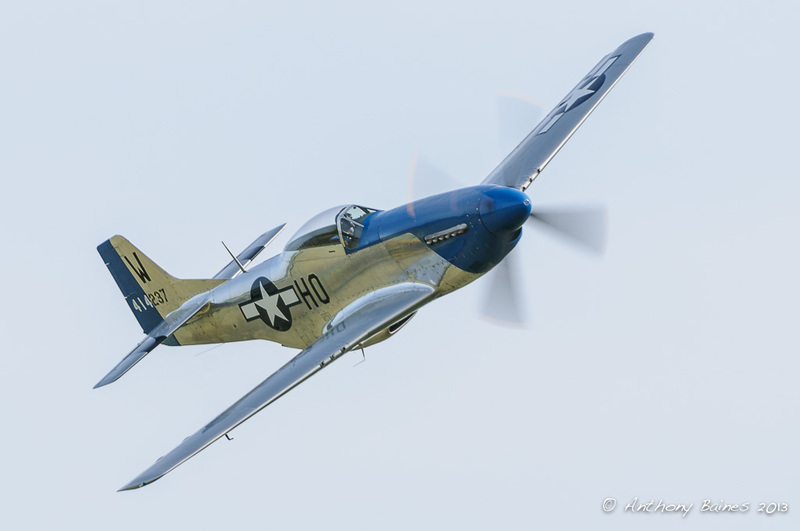 It has taken some time, but this blog post is about that period in July that I look forward to every year: the consecutive weekends with the Flying Legends airshow at Duxford, followed by the Royal International Air Tattoo at Fairford. Mustang Heaven: Miss Velma, Princess Elizabeth and Nooky Booky wait before taking off to participate in the final Balbo at Duxford Flying Legends 2013. 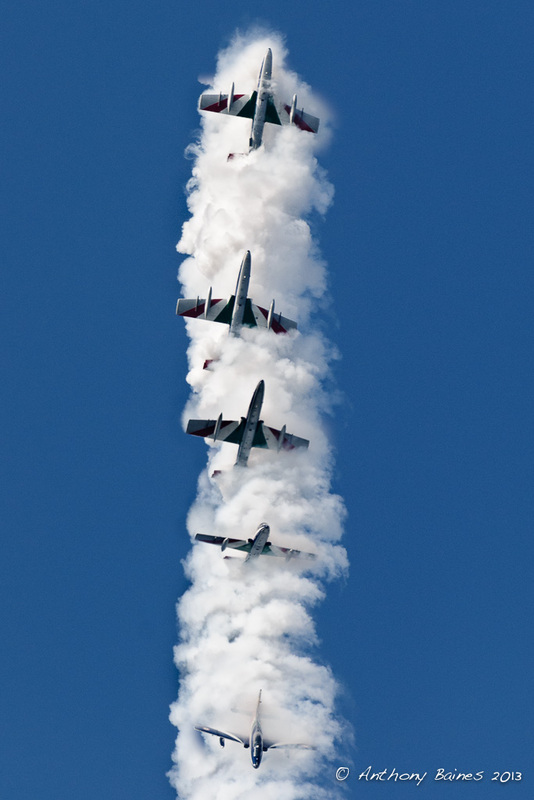 8 overlapping images sticthed into a single panorama. Click for the original size image. 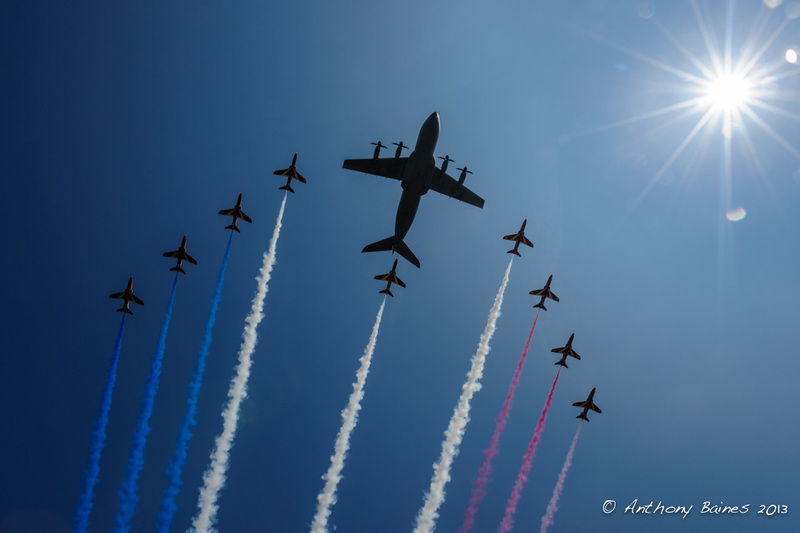 For my taste, some of the biggest draws have been the special imports, such as the P-51C Princess Elizabeth and P-51D Moonbeam McSwine, or the unique formations that have been flown specially, such as the new A380 or A400M with the Red Arrows. 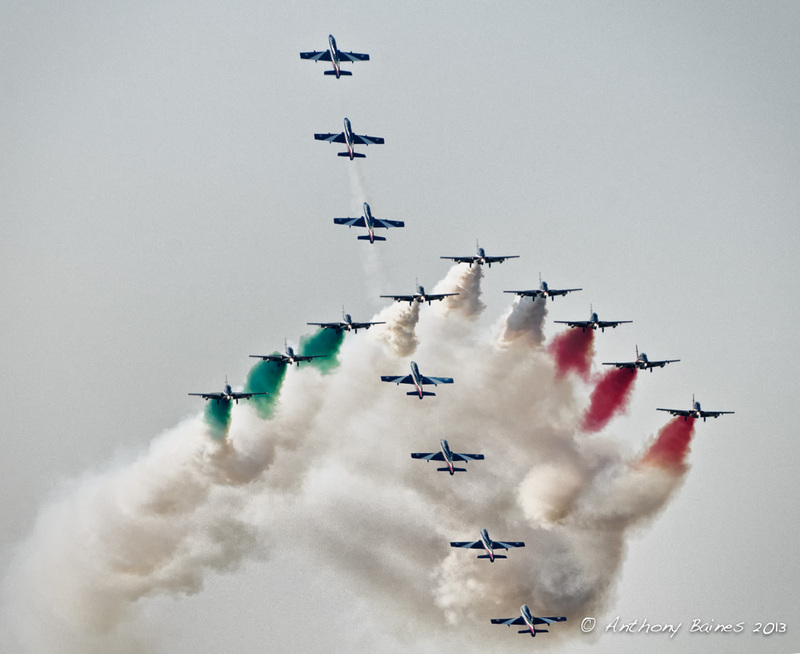 And on top of that was my favourite team display of all at Fairford, the Italian Frecce Tricolori. 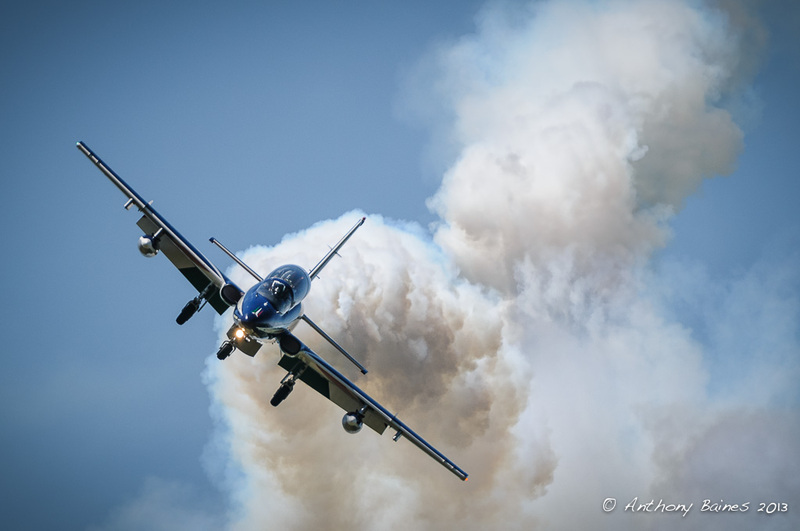 Fairford this year really showed the effects of the continuing economic difficulties throughout the world, with the consequent downsizing of air forces resulting in smaller numbers and less variety of aircraft than previously. The biggest reflection of this derives from the budget problems in the US which have led to the process of sequestration, meaning that no American aircraft from either the US Air Force or Navy have been made available this summer. 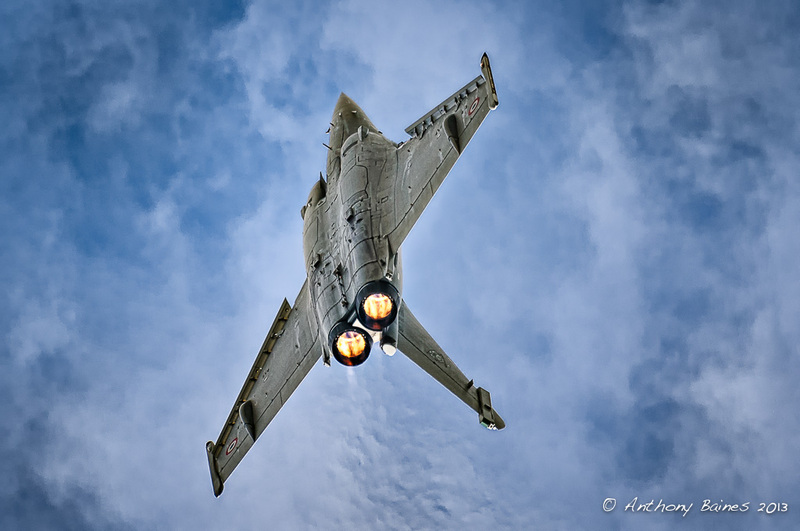 In the past, we've had big ticket items from them such as B-52, B-1, F-117 or F-22 at Fairford, but not this year. 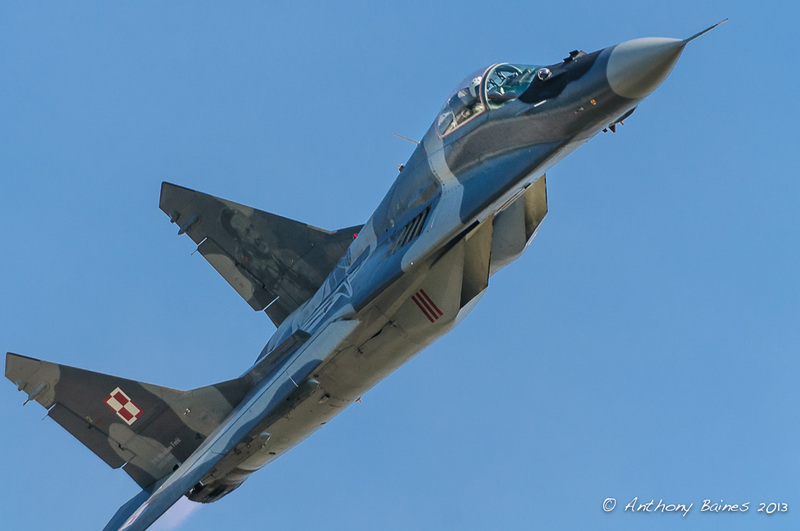 But a good turnout of fast jets at Fairford made up for that, for the most part. 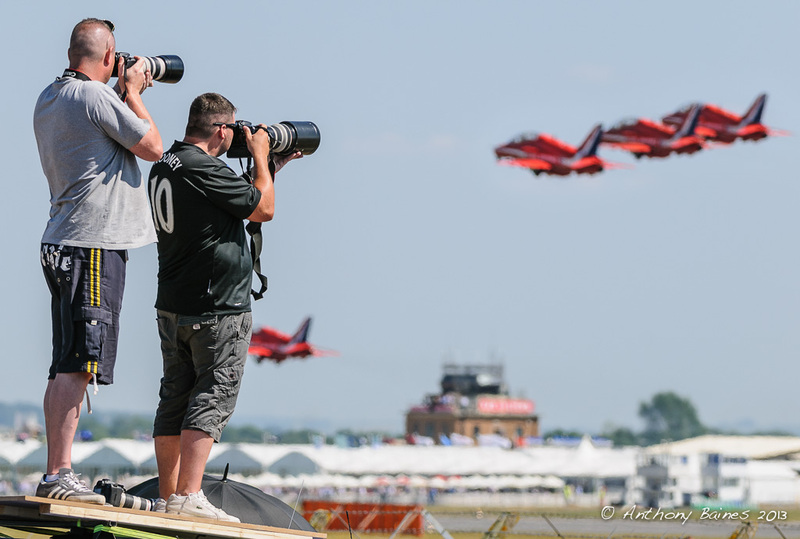 Something I have always done - and I find it a growing interest - is to photograph not just the aircraft but the people at shows as well. 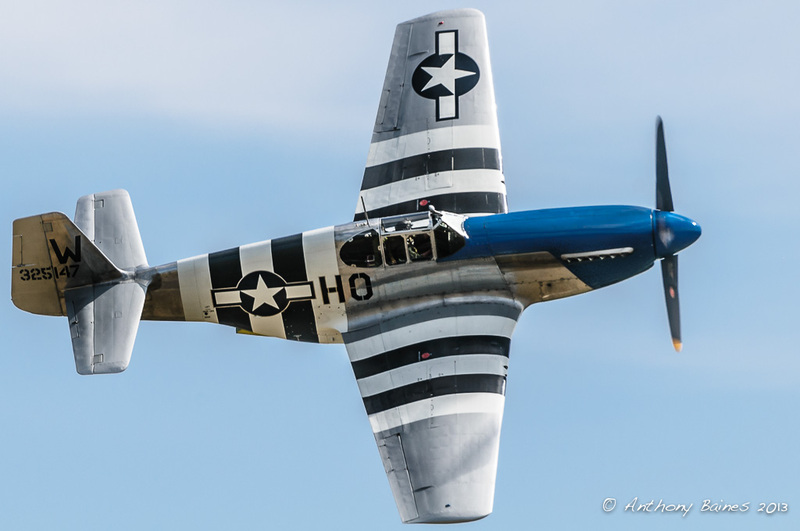 It seems to me that there are two subjects at any airshow - the aircraft and the people - and if you put the two together, there are a lot of interesting possibilities. For example, the Vulcan is a huge draw wherever it goes. 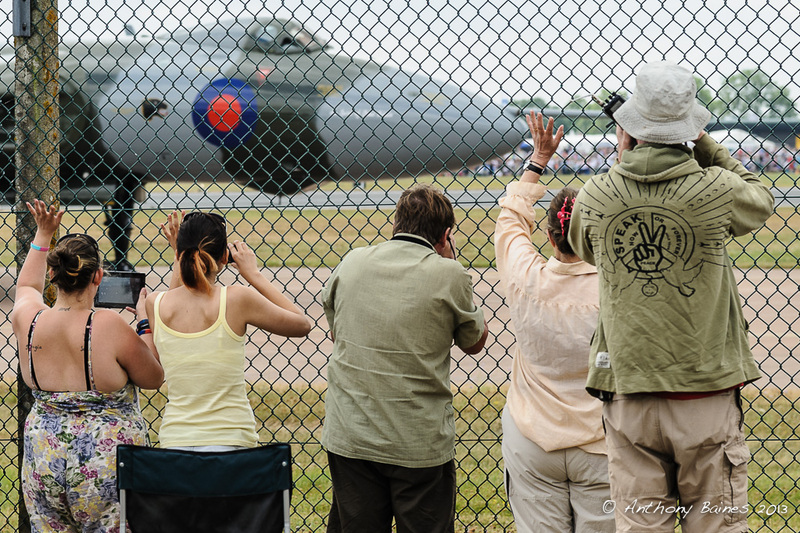 While it taxied past during RIAT, people ran to the fence and waved or took pictures using anything that came to hand, including iPads. Serious photographers are always interesting as well. 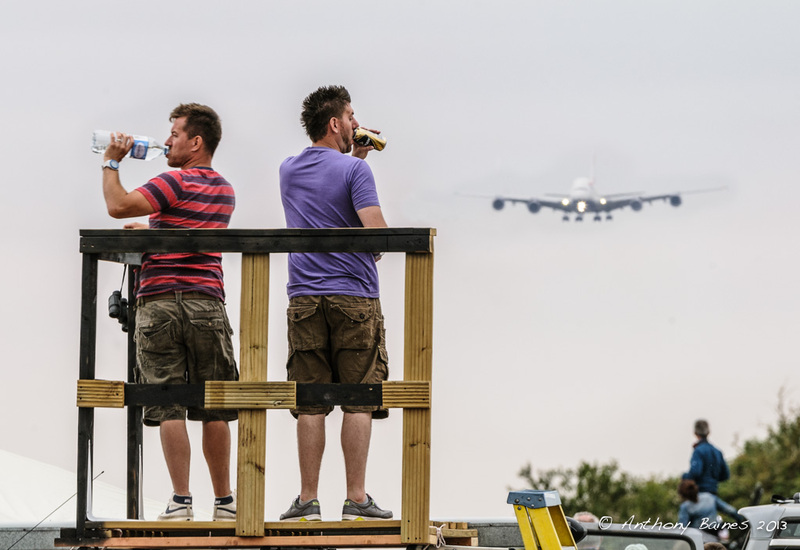 People will stand on anything to get a good view over a fence and grab pictures of aircraft taxiing or taking off. On the other hand, you can't always retain interest. 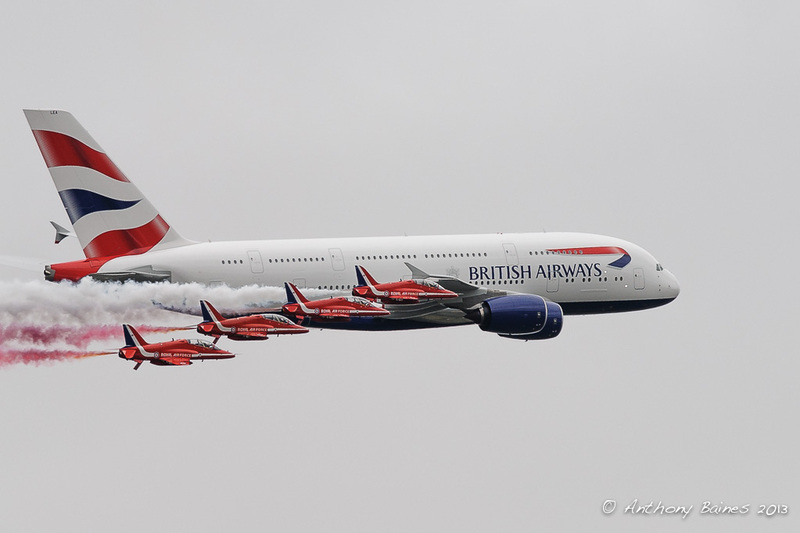 A big Airbus maybe impressive, but it does not always draw spectators attention. 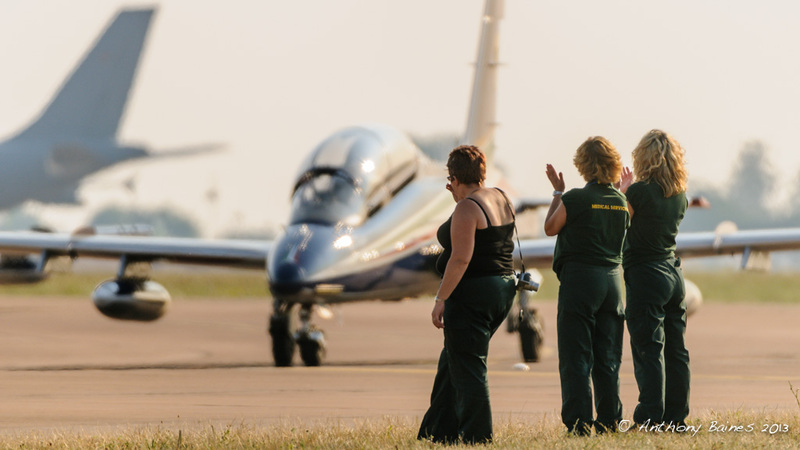 Finally, the Frecce are always hugely appreciated - even the paramedics standing by the taxiway applauded as they rolled in after their display, at least those who were not otherwise engaged with an ice cream.